I’ve long been a fan of all things considered “Elvis” desserts. I’m just a sucker for unique and weird flavor combinations all together but in reality the Elvis flavors aren’t that weird to begin with if you really think about it. Now I know there are people who turn there nose up at bacon in, on or even around sweets. But those who haven’t tried it are seriously, SERIOUSLY missing out on one of the best flavors there are known to man. I’m bacon sweets all day EVERY DAY, hands down no denying it. Have I made myself clear on that yet? I think so. 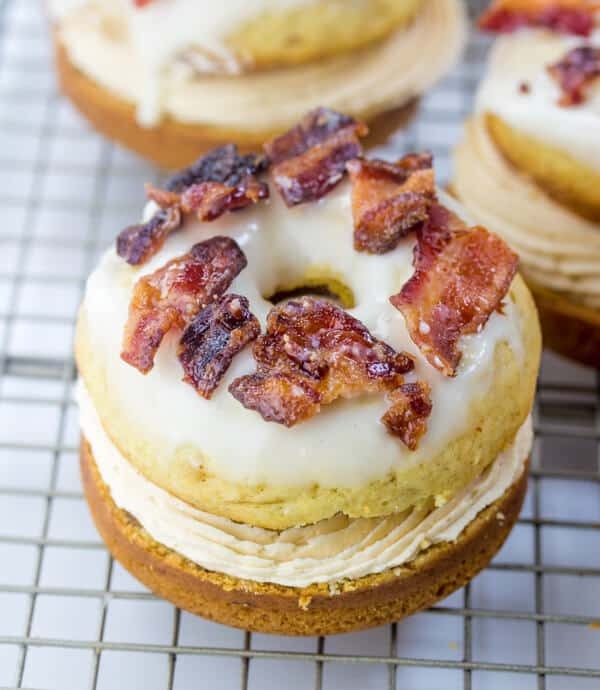 Anyways, so how did these Elvis Donut Sandwiches come into fruition you may ask. 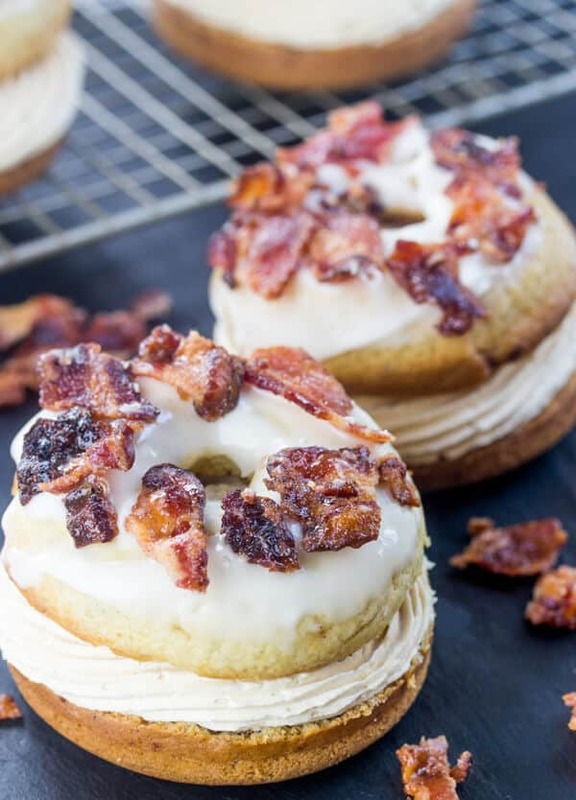 Well my husbands boss was saying how he liked bacon donuts so I had all intentions of making him bacon donuts (which I did) but I also wanted to create something wild for my husband to bring into work as well. I had already candied some bacon and I had some bananas laying around and then I had an aha moment. Yup don’t you just love those moments when it comes into your head and you’re so excited about the fact that what you’re about to make is going to be so darn tasty (at least you hope it will) and you can’t wait to share it with the world, or your own mouth. 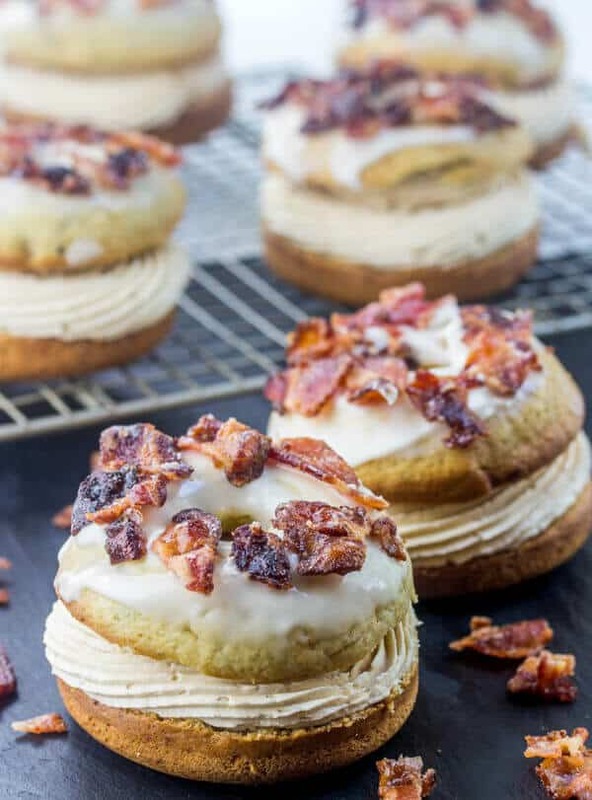 Yeah that’s the feeling I got when I thought of these Elvis Donut Sandwiches. I mean the name really suits them well. 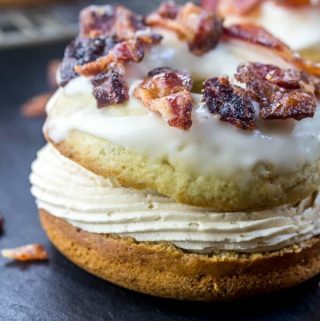 They are in fact a donut sandwich. You have moist banana donuts that sandwich peanut butter frosting. 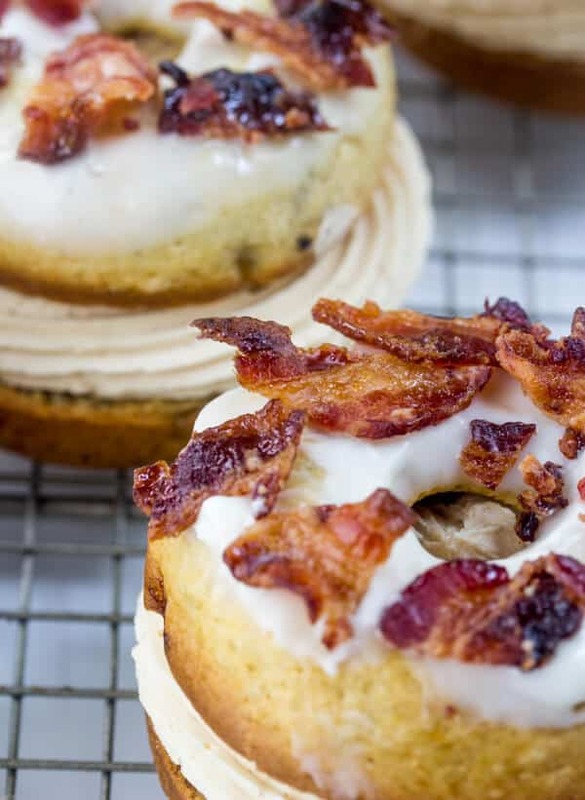 The tops are dipped in a simple powdered sugar glaze and they are all topped with candied bacon. I mean if that doesn’t get you drooling I honestly don’t know what will! These are heaven on earth. But they probably pack a hefty caloric make up behind them. But you know, we can all indulge and splurge every once in awhile as long as it is moderation my friends. everything in moderation. It’s called balance. Once you eat these, promptly go eat all things green for the remainder of the day! 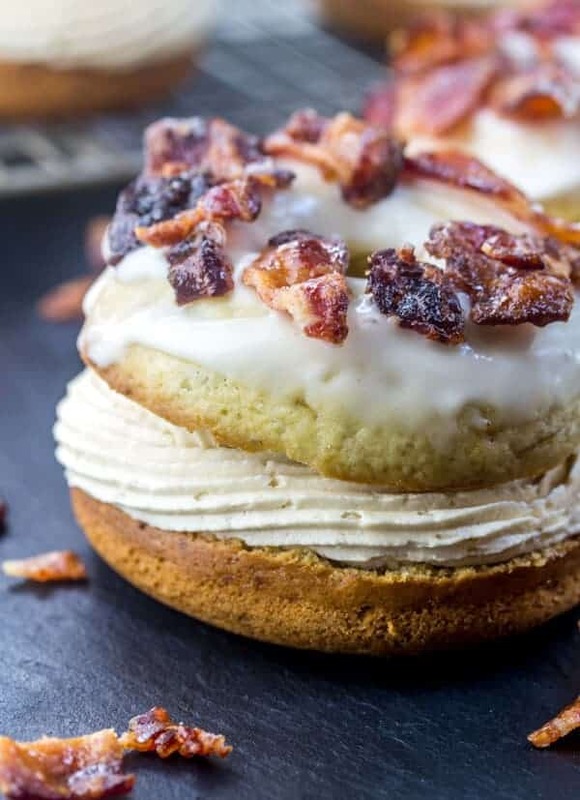 So if you want something filling, delicious, noteworthy and a show stopper then these Elvis Donut Sandwiches are what you need! And ladies…if you want to please your husband and possibly his co-workers….then these need to be made! On a foil or silpat lined baking sheet add your bacon and sprinkle with brown sugar, pressing into bacon. Flip bacon over and repeat to other side. Bake in oven for about 25-30 minutes flipping half way through. Remove from oven to immediately remove bacon to cooling rack. Meanwhile turn your oven to 375. In large bowl mix together your flour, sugar, baking soda and salt. In another bowl mix together your eggs, milk, sour cream, banana, oil and vanilla, stirring until combined. Add wet mixture into dry mixture and stir until just mixed. Spray 2 standard donut pans (or one and work in batches) with non stick cooking spray. Add your donut mix to a piping bag and pipe into donut pan. Bake for about 10 minutes or until set and donuts spring back when touched. Once cooked, remove from oven and transfer to cooling rack to cool completely. To make your frosting mix together your butter, shortening and peanut butter until blended. Add in your powdered sugar 1 cup at a time until you reach your desired consistency. If it gets too thick then add some milk. In small bowl whisk together your glaze ingredients. Once bacon has cooled, chop into small pieces. To assemble, cut your donuts in half. Add your frosting to a piping bag and pipe over bottom half of donut until covered, repeat for remaining donuts. Dip the tops of the donuts into the glaze mixture and then place on top of frosting. Sprinkle with candied bacon and serve.